I spent my weekend in Bandung with family. Though Bandung is a popular weekend destination for Jakartans, it has been two years since my last visit! That’s why I was very much excited to go.The main reason to visit Bandung was to attend my brother’s event. He’s a final year student at ITB’s art faculty and the event – a Japan fair which was held on Sunday – showcased his design. Of course while we’re in town we did not forget to enjoy Bandung’s two obvious “attractions” i.e food and shopping. Hehehe. Despite having little time there, we were able to eat a lot! Hahaha. Our first stop was Warung Lela. Located up north of Bandung, I think the homey restaurant serves the best Mie Ayam/Yamin. Going to this restaurant brings me memories from my high school and early college days as I always ate there whenever I visited Bandung with my friends, back in the days. Afterwards, we visited Rumah Mode, a famous factory outlet store in Setiabudi area. Lucky us, unlike usual, it’s not too crowded. Mum enjoyed her reflexology massage while me, my brother, and my cousin enjoyed a little bit of shopping spree 😉 If you happen to visit Rumah Mode, don’t forget to try Rumah Tahu, a snack vendor located in its food court which sells the best Tahu Mendoan! Like I said before, Bandung has become a very popular weekend destination. Hotels are mushrooming in town, from budget ones until those with luxury. This makes finding a hotel in Bandung an easy task, especially when you’re searching for it online. But… I would suggest to avoid North Bandung area, especially around Jalan Dago, Cihampelas, or Setiabudi. The traffic there can get frustrating on weekends! Of course Bandung is not a big town so even though there’s traffic, it wouldn’t get as bad as Jakarta. But still, for me personally, I left Jakarta on the weekend to avoid traffic, so that’s the very least thing I would like to experience while in Bandung. Our choice of hotel last weekend was Hotel California Bandung. Despite its rather-funny name, it met my expectation very well. We stayed in their Suite room for IDR.900.000 a night which accommodated the four of us conveniently. We got complimentary breakfast for two person, and the amenities in the room worked well. Perhaps there are many cheaper options since we only spent very little hours in the room (read: only came there to sleep and shower, left early the next morning), but I love the fact that the hotel is located in Jl.Wastukencana, which is still close to jl.Dago but not as crowded. After we checked in to the hotel, we went out again to have afternoon tea, which followed by dinner. 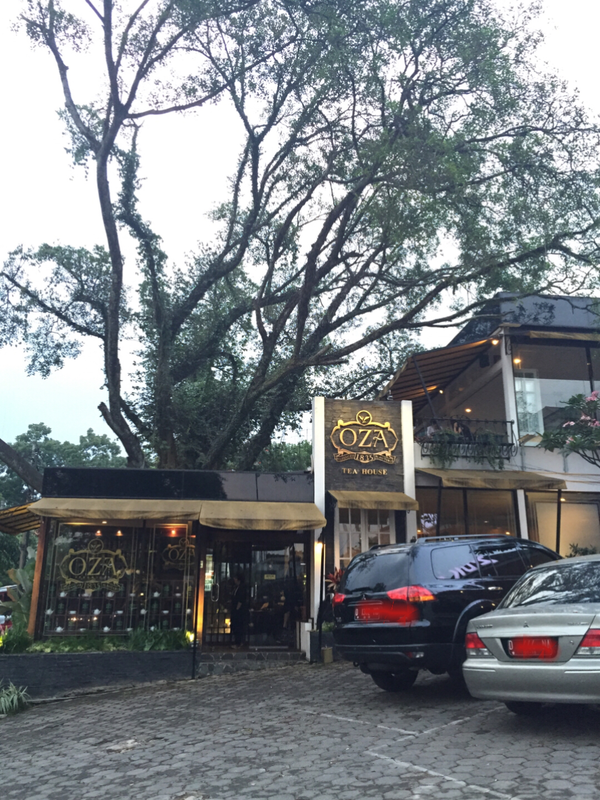 First, we went to Oza Tea House in Jl. Diponegoro. 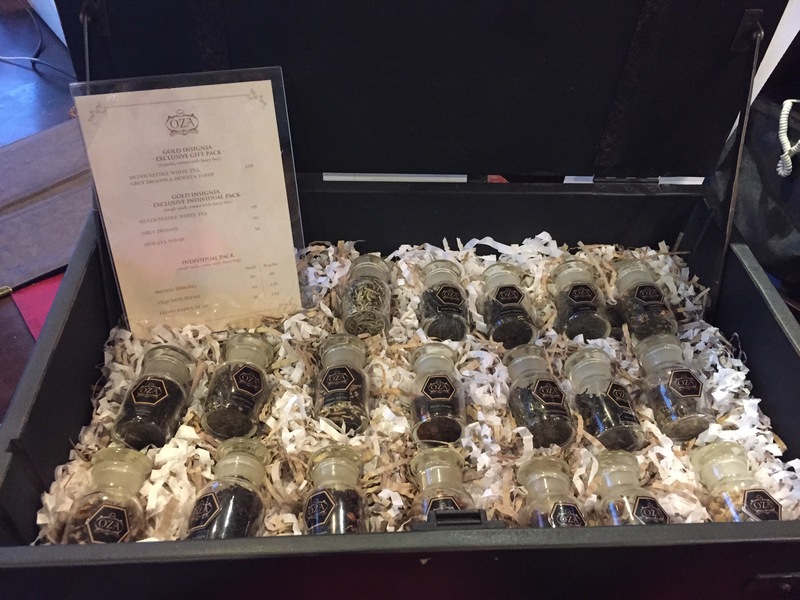 This, ladies and gentlemen, is heaven for you tea lovers (like my mum)! Really, she was in awe the whole time we were there. They sell serious tea as in they really know the tea business.. not just selling ordinary “ice lemon tea” or “green tea with something something”. Unlike my mum, I’m not that much of a tea fan but I have to admit their tea is good stuff. 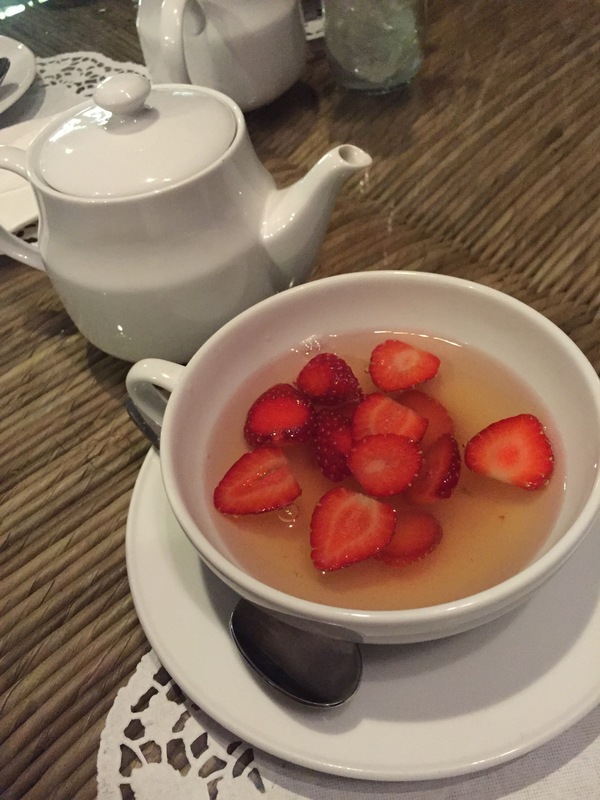 Here’s what I ordered.. genmaicha tea with strawberry. It has a unique blend of green tea taste, sweetness (from the sugar), and sour (from the strawberry). Overall, if you want to chill while enjoying high quality tea, this is the place! 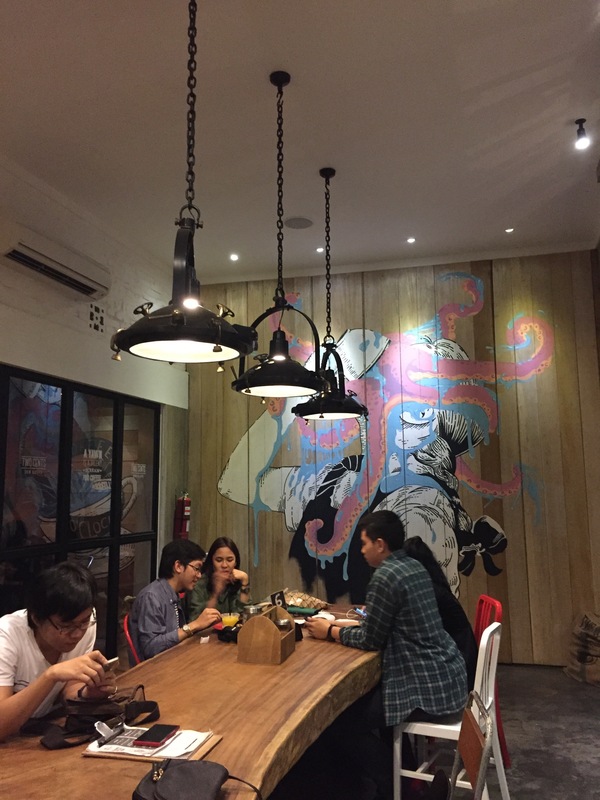 For dinner, my brother recommended Perky Pedro in Jalan Riau, so we went there. What is it? I’ll write a separate post on it! After dinner, we went for coffee at Two Cents at Jalan Cimanuk, not far from Jalan Riau. 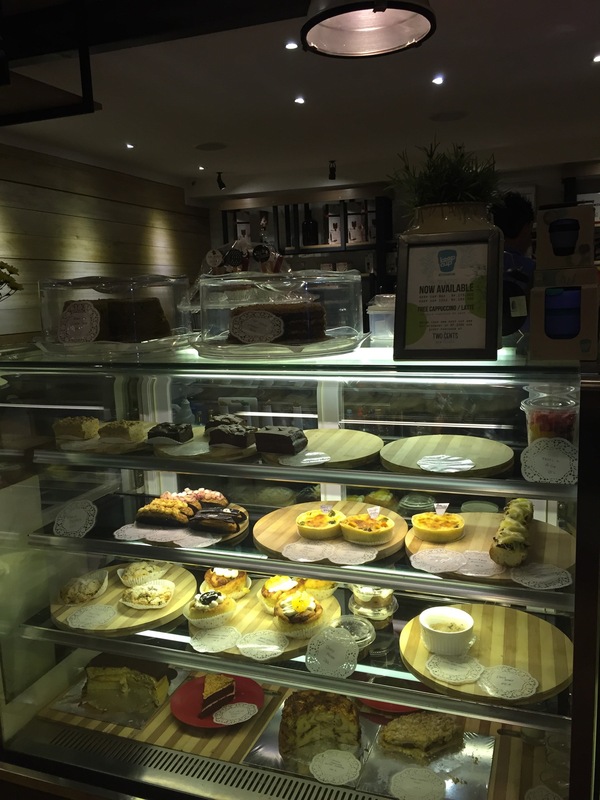 The place does not only offer coffee but also a selection of delicious desserts and food. Scrumptious desserts and lite bites.. I ordered raspberry + White chocolate eclair, croissant bread butter pudding (both are very yummy but I forgot to take a picture), and… Bacon Piccolo Latte. Yep, you read it right! At first I was very much hesitant to order it, but then I remembered, life’s too short and I’m on holiday, so I did it! I ordered it. It turns out to be very good! 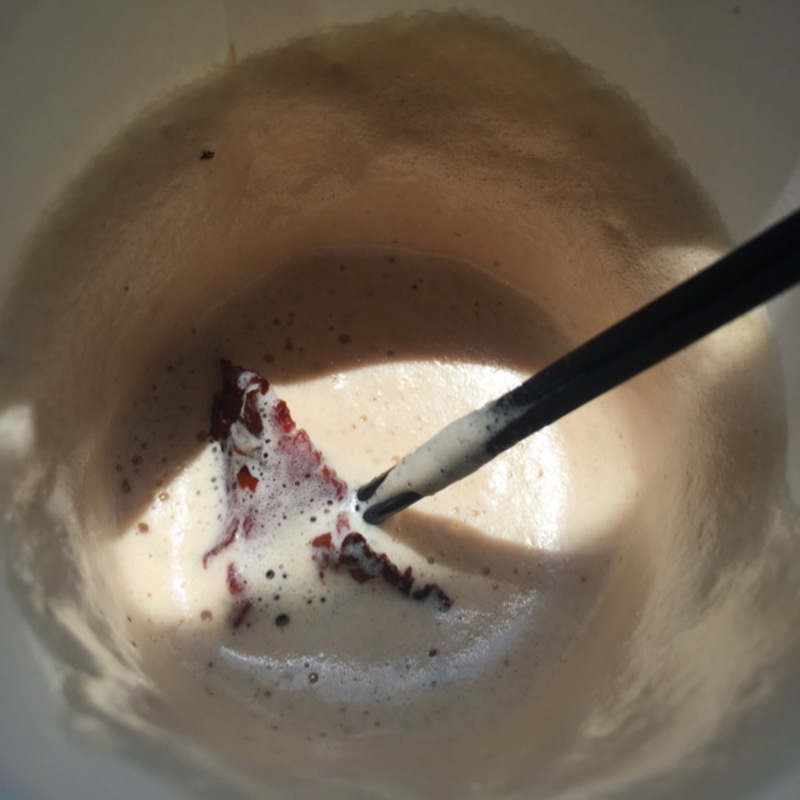 It’s basically a latte + a strip of beef bacon. The saltiness of bacon compliments the bitter taste of latte. Though it’s not gonna be my favorite kind of coffee, but I would surely order it again. The next day, we started our day by having breakfast at Miss Bee Providore at Jl. Rancabentang, in Ciumbuleuit area. It was love at first sight. I love everything that is about this place, and I’m going to write about it in a separate post as well. Bandung masih juara aja ya buat jual suasana…. dulu pasti lebih adem udaranya, dan nggak macet pastinya.. Previous Previous post: Where should we go? Next Next post: Angkat Raketmu!